In Windows, if you delete an important file, even from the Recycle bin, it’s still entirely possible to recover that file as long as it doesn’t get overwritten between its deletion and your attempt at recovery. That’s because the file is never truly deleted and Windows is just told that the space the file occupies is available to write over when needed. In this case, a free tool that you can use to recover data is all that’s required. But this is obviously not good if you want to permanently delete a personal or private file because anyone could just try to recover it. Once a deleted file has been overwritten by something else, it’s very difficult to recover and more professional methods would be needed to get any readable data back. There are various ways to overwrite deleted files; If you sell/give your drive to somebody else, it needs to be completely wiped so nothing is left on it that can be recovered at all by the new owner. You can also erase the deleted data off a currently used drive by wiping all its free space, which overwrites all old deleted files. Then there’s the method we’re talking about here which is to completely overwrite and wipe the file or folder as you go. This method is the quickest and most secure as the files are erased immediately and not left in a recoverable state until the next time you decide to wipe the drive’s free space, which could take a long time depending on its size. Here are 10 free tools which can securely erase or “shred” your files making them unrecoverable. This is something which should be used with care as once the file is gone, you won’t be able to get it back even with recovery software. All tools were tested in Windows 7 64-bit but should also be XP, Vista, 8/8.1 compatible. WipeFile is a portable only program so is also useful for your USB toolkit. It supports 14 different erasing methods ranging from a quick 1 pass zero fill up to a full 35 pass Gutmann erase. Individual files or whole folders can be added to the program, something that is very useful is an editable file mask for folders so you can filter what gets erased by file extension. The default of *. * will delete all files in the folder, whereas a mask of *.doc will only shred the Word documents and leave all other files. WipeFile is multilingual with 18 languages supported and in Settings you can create a context menu or Send To menu entry to send files to the program via right click. A few options such as a user defined erase string and logging are only for the Pro version which requires a donation. There’s quite a lot to like about HardWipe because it has several different types of erasing on offer, such as wiping Recycle bin contents on selected drives, wiping a drive’s free space, wiping a drive or volume completely or shredding files and folders. There’s also a portable version as well as a setup installer version, the latter is needed to use the right click context menus. Sadly an annoyance in the program is the inclusion of advertisements inside its main window unless you upgrade for $8.99. There are 6 wiping algorithms to choose from (1 pass up to 35 pass) and an option to rename the files up to 10 times to lessen the chance of recovering the filename. A speed mode can help system responsiveness on long operations and the system can be auto powered off after a wiping operation has completed. 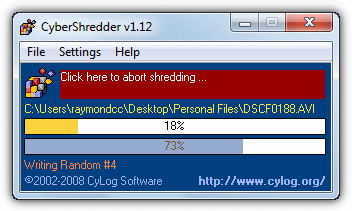 CyberShredder is a small and compact tool that needs you to enable the “Confirm file deletion” option in the Settings menu if you want a final warning. Otherwise any files or folders dropped onto the program window will be instantly erased which could be a costly problem if you make a mistake. There are Very Quick (a single zero pass), Quick (a 3 pass of 0’s, 1’s then random) and Normal (an NSA approved 7 pass) shredding methods available in the settings menu. During erasing files are also renamed multiple times to help reduce recovery chances even more. 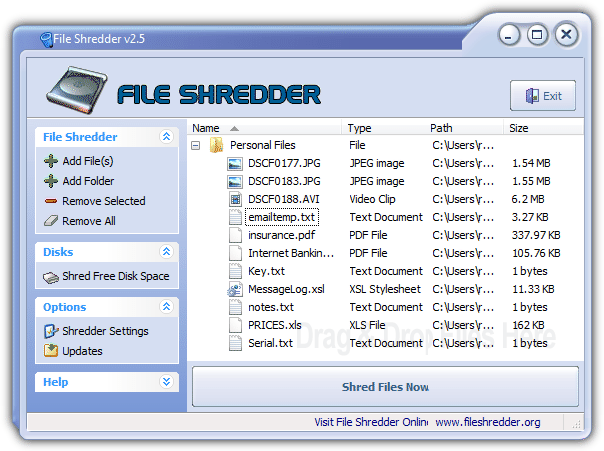 CyberShredder is portable but still allows you to create a Send To right click entry to erase files and folders instantly through Windows Explorer. The Eraser application is definitely a more serious and focused shredding tool with some advanced features compared to many other tools of this type. One such addition is the erasing scheduler which allows you to run tasks to shred files, folders, free space or the Recycle bin contents at specific times or on system restart etc. It also has 13 different erase algorithms to choose from, Windows Explorer integration, an option to unlock locked files before erasing them, drive free space erasing when you right click on the drive in Explorer, and the ability to replace erased files with pre selected files to allow for “plausible deniability” as the program calls it. The latest version of Eraser is installer only but there is a slightly older version on PortableApps.com. File Shredder is more of a permanent erasing solution because it needs installing and there’s no portable version, but it does have some useful functions which could make it worthwhile. Erasing algorithms include simple 1 or 2 pass, DoD 3 pass, secure 7 pass or the Gutmann 35 pass method. There’s also Explorer integration which can directly erase the file/folder immediately or add it to a queue to be shredded later on. Another useful function is the free space shredder which will completely erase all unused space on the selected drive using one of the above methods. Files and folders are added to the list using drag and drop or the add buttons on the left. The links in paragraph #2 of this article will help you. You can’t, that’s the whole point of shredding a file in the first place. Great article Raymond..Helpful for those in search of erasing tools..Keep up the good work.. Thanks you for the article. It’s very useful to me……….. Thank you for the article, I’m using Gutmann method, it seems more efficient. PartitionGuru is able to delete files permanently as well as wipe deleted files for good. I would like to see a simple utility that securely deletes my Recycle Bin (or replaces it). I still like sending files to the Recycle Bin, and like to right-click to empty. There’s a few utilities that do this, but they are bloated beyond my liking. I’m looking for a eraser program that can automatically delete a log file that is in use at every restart. I had eraser but there are a few problems with it. The pc shutdown is very slow because eraser.exe hangs to long in memory and the pc has difficulty for shutting it down and it misses the function of erasing a ‘file that is in use’ on ‘every’ logon. I’m looking and I have tested a lot of programs but so far no one can delete a ‘file that is in use’ and that on ‘every time’ the pc logs on. Is there someone here that can help me with finding the right program for this job? I have used many of the listed apps. The one I am mostly using now is from Moo0 File Shredder. A free tool, with multiple levels of shredding, from one-pass pseudo-random data (including cluster tip and ADS, and changes file name and attributes as part of delete process), up to the over-kill level. It would be useful, IMO, to explain to folks that the so-called Gutmann 35 pass is truly overkill, as it (a) technically would run less, as some of the 35 passes are methodologically designed for HDs no longer being sold, (b) takes F-O-R-E-V-E-R (it seems) for all the passes to complete, (c) will really exercise your HD, so may not be best if it is in marginal condition and planned for re-use. Thanks for great info site. We went into a bit of an explanation in the “8 Tools to Wipe a Hard Drive Before Selling or Lending It” article about the fact the Gutman pass method is pretty much irrelevant today. Won’t you consider to try and review secure wipe? Thanks mate for the nice article ;). Hey Hal, I found the best way for wiping an entire drive and it’s pretty fast. Most drives come with a secure delete built into the hard drive itself. The computer manufacturers disable it in the bios but there is a way. A university, It is at University of California, San Diego, the place where they created it is called [Center for Magnetic Recording Research ] They made a program that you can boot from and it will securely wipe a drive where it’s unrecoverable. It’s it’s called Secure Erase and it’s free. And it is pretty much created by a bunch of genius scientists. I actually used it recently on a 6 year old computer and it worked like a charm. This is what the government really uses, not that DOD 7 pass crap. Thank you very much Raymond for sharing ! I work with HardWipe and i just can say that never failed.